A recent study out of UC Berkeley has discovered that tiny golden-winged warblers can predict impending storms — or rather, they can actually hear them approaching. Scientists hope to use what they've learned to help save lives ahead of violent weather. In April, a massive thunderstorm unleashed a series of tornadoes that tore through the central and southern United States. Scientists say a peculiar event took place just two days before the storm: Flocks of songbirds fled the area en masse. Many golden-winged warblers had just finished a 1,500-mile migration to Tennessee when they suddenly flew south on a 900-mile exodus to Florida and Cuba. At that time, the storm was somewhere between 250 and 560 miles away. The researchers said that the birds somehow knew about the impending storm. Why, the researchers wondered, would these tiny birds travel so far from their already-grueling migratory route? Upon further inspection, the scientists found that the dates the birds broke with the pattern coincided with the beginnings of the storm. In a paper reported today in the journal Current Biology, the team suggests that the birds made their "evacuation migration" because their keen sense of hearing alerted them to the incoming natural disaster. 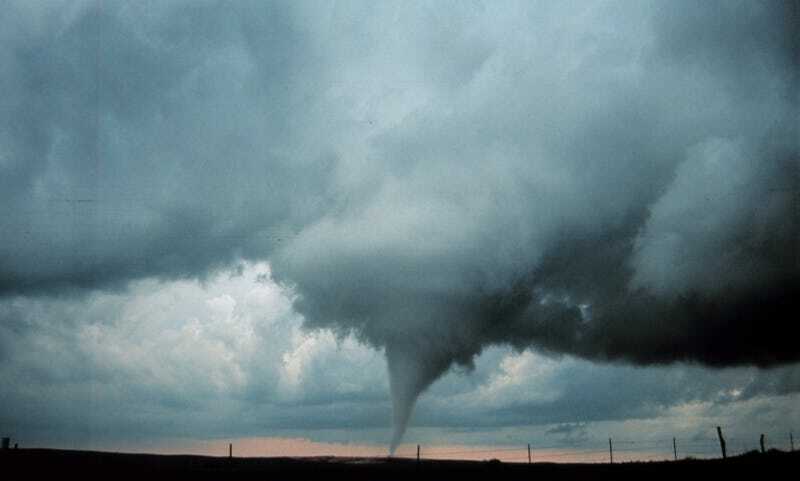 Huge tornado-spewing storms produce infrasound, or noises at frequencies below 20 hertz travel for thousands of miles, according to Streby. That sound, which is too low for humans to hear, travels at the same frequency that birds can detect. Could further study of songbird behavior help improve storm-warning systems? It's an certainly an intriguing idea. Top image via NOAA Photo Library; lower image via The Atlantic.